« Older: 2018 Costa Maya Festival presents: Miss Panama! Newer: » Costa Maya 2018 Presents Miss Belize – Marcia Moody! A reliable source has confirmed to The San Pedro Sun that Ambergris Caye’s very own Horacio Louis Guerrero was cast to play a minor role in Telemundo’s second season of the popular Spanish series, La Reina del Sur. 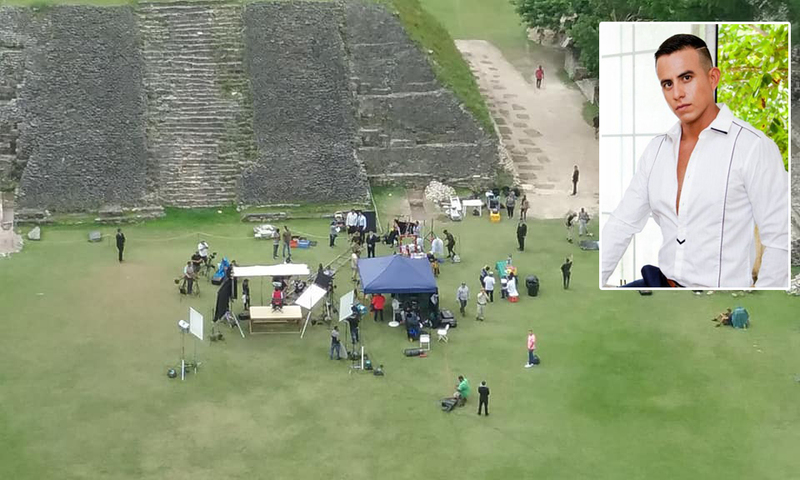 The soap opera’s production starring well-known Mexican actress Kate del Castillo, filmed a few scenes in the western District of Cayo, Belize by the Xunantunich Archaeological Reserve from Monday, July 9th to Friday, July 13th. The island actor is said to have played his role alongside Humberto Zurita and Mark Tacher. Both Mexican actors are main characters in the telenovela. Guerrero also shared the set with actor Emmanuel Odenay, who has participated in productions like Señora Acero and Señor de Los Cielos. La Reina del Sur is based on a novel of the same name by Spanish author Arturo Perez-Reverte. The first season was released in 2011, and the drama depicts the rise of Teresa Mendoza (Kate del Castillo), a young woman from Mexico who becomes the most powerful drug trafficker in southern Spain. The second season, also based on the original work of Perez-Reverte revolves around Teresa Mendoza eight years after the events of the first season. She has disappeared, living an idyllic existence in Tuscany, Italy. However, the kidnapping of her daughter forces her to reintroduce herself into the underworld of drug trafficking and once again confront her old enemies and the past she tried to leave behind. Filming officially began on April 2018 in Tuscany, Italy, but most of its filming will take place in Colombia, South America. La Reina del Sur 2 is scheduled to premiere in 2019. The San Pedro Sun looks forward to the upcoming season, and congratulates our island actor for scoring this role! Ivy Queen to headline the 2018 Costa Maya Festival!